Initially it was kind of a fun challenge to calmly brush my teeth while the boat bucked like a bronco on steroids. The novelty wore off when I became too nauseous to hold the tiller (which steers our boat) for even a moment or two. This marked the only time I’ve ever made my contribution to Capt. Nemo, feeding the fishies. I made up for lost time. Upon arrival, I chose not to mention this in my call to Mom, a non-boater and definite worrier. We learned -- later -- sailing this section on a full (or new) moon dramatically impacts the tides. Add to that wind waves formed by 20 mph gale winds. The result? “Confused waves” which come irregularly from every direction, and up to 8 foot “standing waves” which are spiky and tend to literally and violently rock the boat. In our relatively tiny 27’ sailboat, the whacking motion feels like something between a hard slap and a wrecking ball slam. This broke our auto-helm – aka – assisted steering, which is like losing a crew member. The sea calmed down much more quickly than my stomach. Wayne’s unfurling our jib sail further steadied our boat. 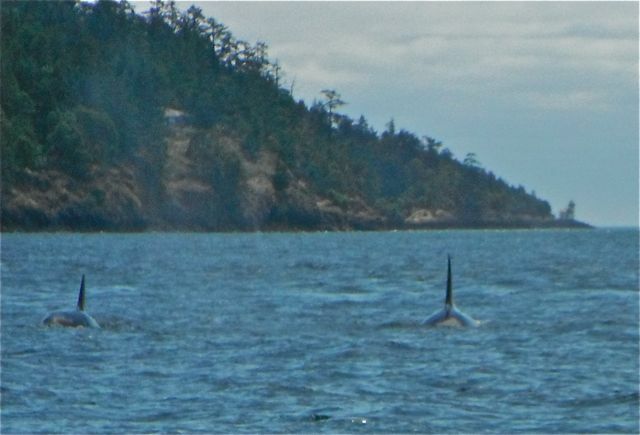 It took laying flat out and a visit from a pod of Orca whales hugging San Juan Island for a full recovery for my stomach to settle. There were probably 20 whales in the pod, entertaining us. Their audience included several whale charters another sailboat, a couple power boaters, two protection boats, and several kayakers, who were literally pressed against the shore while less than 10 feet away the killer whales spouted, and at one point even leapt SeaWorld-like, fully clearing the water’s surface. Despite all that, we cooked along at up to 9 knots of speed**, arriving at Roche Harbor at 2:15, we figure 7 hours to cover 40 miles, less the killer whale show. Mike Hilliard puttered up in his dinghy, “Fate” to welcome us and help tie us off to a neighboring mooring ball. More about Mike and Dawn Hilliard and “Destiny” in the next post! Our maiden voyage in our dinghy was less smooth. After several tries, we decided our 50s vintage Seagull motor with the pull starter that pulls over after every pull (by design), was more trouble than it was worth. We paddled, clumsily, with our $10 paddles, to the marina, filled with multimillion-dollar yachts. It may be called Roche Harbor, but “rich harbor” would be more apt. But one of the best parts of boating “for the rest of us”? We all get the same spectacular view, no matter how much or little we paid for our boats or what they look like. *Trust you can fill in the missing letter. This is the PG version. **In normal conditions, when our boat is neither hindered nor helped by wind, tides or current, our O’Day motors along at 5 ¾ knots.